What is Bernie Sanders’ Plan for Student Loan Debt? Bernie’s complete plan for the 2020 election cycle hasn’t yet been announced, and his old page on his program calling for making college tuition free for all (the Bernie Sanders “Free College Plan”) has been removed from the Internet. To be perfectly honest, this is a little light on details, so to find out what Bernie’s 2020 Student Loan Plan might look like, I’ve outlined the details from his original Free College Plan proposal below, and I’ll update this page when new information is released. For now, take a look at what he proposed last election cycle, and keep in mind that because Senator Elizabeth Warren’s Student Loan Debt Proposal is way more comprehensive than Bernie’s old one, he’ll probably have to offer much more this time around to the remain the darling candidate for young people, and especially for those of us buried in college loans. Let’s make one thing perfectly clear – even if Bernie were to get elected President AND get his student loan plan passed, it’s going to take several years for those benefits to start offering any real financial relief to current borrowers. If you’ve got existing student loans that are causing you serious financial trouble now, then you will certainly need to look elsewhere for assistance in the meantime. Senator Bernie Sanders’s Free College Plan plan included six key tenets, each of which would dramatically reduce the cost of a college education, either by reducing the amount that must be paid for tuition and fees up front, or by cutting the expenses after the fact, once debt has already been accumulated. The good news for readers of this site is that Senator Sanders’s plan included help for ALL Americans who funded their college education costs with Federal student loans, and that he doesn’t appear willing to leave anyone behind. This is a good sign that his proposal for the 2020 election should offer similar relief to everybody, not just some tiny slice of heavily impoverished borrowers. And that’s a sharp contrast to the original President Obama Loan Forgiveness Program, which only offered debt forgiveness and relief for so-called “recent” graduates when it was initially introduced, meaning that basically everybody who had already been struggling with student loans for years was left hung out to dry. What is Bernie Sanders’ Free College Plan? Way back during the run-up to the 2016 election, Bernie Sanders proposed offering free college for all Americans, if elected President. Bernie’s proposal sought to make college tuition free and college graduates debt free as soon as possible. This time around, Bernie hasn’t yet announced the full details of his plan for tackling the student loan crisis, but you can bet that it’s going to be about the same as it was before, since Bernie is not the type of waffle on his views. Below you’ll find the full details of his 2016 proposal, including exactly what he planned on offering, how he planned to structure it, and what it would have cost to implement. If you’re like me, you might have even had to take a deep breath after reading through that list, because these are virtually all of the things that we’ve all been saying need to be done for years! In fact, I can only think of a single other reform I’d like to see added to this list (expanded opportunities for Private Student Loan Debt Relief). That’s probably the only other thing that would help the visitors to this website as much as the six simple steps outlined in Senator Sanders’s plan. To be honest, I’m not the world’s biggest fan of everything that Bernie Sanders has to say, but I find his Free College Plan to be so compelling that I can’t help but support it, and him. Let’s go through each of these six tenets one by one. Bernie’s proposal to make tuition free at all public colleges and universities (which means all state colleges and universities) is not an entirely new idea. In fact, it’s based on the historic precedent set by Germany, who eliminated college tuition entirely because they believed that the $1,300 annual fee they were requiring for attending college was discouraging their people from receiving higher education. Could you imagine how many more Americans would be able to go to college if it only cost $1,300 a year? Just think about how much more discretionary income you would have if your total student loan costs were based on a $1,300 per year tuition rate. In an economy powered by consumer spending, how much more money would be getting pumped back into housing, transportation, and consumer goods, rather than getting funneled into the pockets of bankers and corporations, who do little but hoard the cash for their own self-interest? And just so you realize that Bernie is not alone in this measure, it’s also reported that Chile is about to make college free for its citizens next year, and that Finland, Norway, Sweden and several other countries have been offering the same to their citizens for many years. Bernie asks: if these countries can afford to make college free for their citizens, then why can’t the United States? Probably the best part about this part of the plan is that all the crazy rules and regulations governing Federal Student Loan Forgiveness Programs would basically be thrown out the window for future college graduates, since they would be avoid the avoid the current process of racking up a mountain of debt that one hopes will get “forgiven” at a later date. According to current projections, the Federal Government is set to make a profit of over $110 BILLION dollars on the student loan programs over the next 10 years. Bernie Sanders’s stance on student loans is that this is not just morally wrong, but also bad economics. To address this problem, the Sanders Free College Plan proposes to prevent the Federal Government from profiteering from student loans, and seeks to use those former profits instead to significantly lower student loan interest rates. In my opinion, there’s really no reason that the Government should be profiting from offering us, the taxpayers who fund all of their work, the services that we’ve deemed important. The Government’s role isn’t to come up with more money, and it doesn’t necessarily need to be run like a private entity or corporation. It collects money from public taxes, then distributes those tax dollars via services and assistance programs, like student loans which help citizens pay for college expenses. Why should the Government get to collect taxes from us, then make money loaning that tax money back to us? Why not cut out the middleman entirely (the Federal Government), and simply allow us to self-fund college costs without the added layer of tax collection and distribution? If Bernie’s plan were enacted, immediate benefits could be realized by dividing up that $110 Billion equally, and offering an instant $2,750 reduction in student loan debt for the 40 million Americans currently paying off their college costs. But that sounds like something that George W. Bush would do (remember his famous tax credit?). Bernie’s got an even better idea in mind, and one that will end up saving all of us significantly more than the initial $2,750 we could get from an instant refund. Read on for additional details. Instead of offering a one-time $2,750 debt forgiveness tax credit, Senator Sanders’s plan seeks to reduce the long-term costs of financing student loans by reducing student loan interest rates. And that’s a great thing for anyone carrying student loan debt of any amount, because interest rate reduction is probably the best thing that could ever happen to reduce our total debt load. Since student loan borrowers plan on paying their debt off over a long period of time (10, 15, 20, or even 30+ years), interest is the primary enemy, since it allows that debt to accumulate and grow. In fact, for most borrowers that owe far more than they can possibly afford to ever pay back, interest rates are the primary reason that they’re in trouble, because interest is the factor that allows debt to grow to excessive amounts so quickly. There is simply no better way to reduce excessive student loan debt than by lowering its interest rate, and Senator Sanders’s plan has made that a core component of the proposed student loan reforms. If you’re one of the people who owes just as much, or even more than you originally borrowed, you can thank the artificially inflated student loan interest rates for that problem, and you should be a strong supporter of Bernie Sanders Free College Plan. If the Sanders Free College Plan is enacted into law, rapidly expanding student loan debt may become a thing of the past, and you may actually be able to get out of student loan debt. As outlined above, interest rates are what make student loan debt such a problem, so this tenet of the Sanders plan is perhaps the most important. In the history of the United States of America, there has never been a better time to borrow money, because the prevailing interest rate is lower than its ever been before. Have you heard about people getting 30 year mortgages with an interest rate of just 3%? Are you aware that people are getting auto loans with 0% interest? Could you imagine how much money you’d save on your monthly student loan payments if you were able to refinance your loans to a similar rate? Federal student loans currently come with an interest around 5-7%, which is significantly higher than what could be provided, especially considering how cheap it is to borrow money for other high-value purchases like homes, cars, etc. And while you’re allowed to change your Federal Student Loan Repayment Plan to rearrange the structure of how long it’ll take you to pay off your loans, choosing even increments, payments based on annual income, and a number of other variables, there’s no option for changing your loan’s interest rate. Unfortunately, the interest rate is the most important component of the calculation that determines how much you’ll end up paying over the life of your loan, so it’s the single most important factor for helping you get out of debt! Under Senator Sanders’s Free College Plan, Americans will be able to refinance their student loans and take advantage of historically low interest rates. If you’re having trouble meeting your monthly payments, then this is the most important part of Senator Sanders’s plan for you, and one that you should ardently support. This is the one tenet of Bernie’s Free College Plan that I’m not so sure about. I love the idea of helping people afford the cost of college, but I always disagree with the idea of giving anyone something for free (which Sanders, as a self-proclaimed Socialist, seems to be in favor of). This part of his plan would require public colleges and universities to provide for 100% of the financial needs of the lowest-income students (but “lowest-income students” is not defined in the plan, so what does that even mean? Is it the lowest 1%? 10% 25%?). I do like and fully support Bernie’s idea of making it possible for low-income students to more easily pay for their college costs by tripling the Federal work study program, which offers a sort of stipend for essentially volunteer labor, promoting the idea that nothing is free in this world, but I’m not a huge fan of the proposal to simply give away Federal, state and college financial aid for room and board, books and living expenses simply because someone is poor, and without requiring some form of work from them to earn the benefit. Trading hours spent in the work study program for coverage of college tuition and fees sounds like a great idea to me, and a logical extension of the best currently existing Federal forgiveness program, the Public Service Loan Forgiveness Program. I especially like this part of the proposal, as it’ll help better prepare new graduates for the workplace, and encourage them to get involved with the real world while they’re attending school. The fewer college students who spend their time partying or endlessly philosophizing, and more who engage with the workforce, the better off our country will be in the long run. Personally, my favorite part of the Sanders Free College plan is the idea that it’ll be paid for by imposing a new tax (a so-called “Robin Hood Tax”) on Wall Street speculators, who Bernie says are responsible for nearly destroying the economy in 2007. This plan is estimated to cost $75 billion per year, and Bernie’s website states that it can be fully paid for by imposing a tax of just a fraction of a percent on Wall Street. Apparently, this plan has even been endorsed by over 1,000 economists, and is similar to a tax that Britain, Germany, France, Switzerland and even China have all required on speculative investments. If the taxpayers of this country could bailout Wall Street in 2008, we can make public colleges and universities tuition free and debt free throughout the country. Depending on which channel you prefer, the response to Sanders Free College Plan has been vastly different. Those listening to Fox News will hear it treated like a joke, or some kind of Communist plan to destroy the country, while those who prefer MSNBC are likely to hear it touted as the next best thing since sliced bread. The truth, as usual, lies somewhere in the middle. Parts of Senator Sanders’s plan are exceptional ideas, while others, I’m not as excited about. Personally, I would love to see Student Loan Interest Rate Refinancing become a reality, especially since it’s never been made possible for Federal loans. A couple years back, Senator Elizabeth Warren proposed a similar measure, but it was held up in Congress by special interests, specifically lobbyists from major banks and student loan companies. And while I think that Senator Sanders plan is probably the best one floated by any of the remaining 2016 Presidential Candidates, I’m also extremely discouraged that it doesn’t include a bit of assistance or relief for those holding private student loan debt. 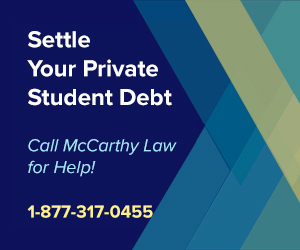 Simply put, Private Student Loan Debt Forgiveness is where the real problem lies, because it’s the holders of private student loan debt who are suffering the most. And again, just like when President Obama enacted his own sweeping student loan reforms, even Bernie Sanders, the Socialist hero, has left those who need assistance most dearly out in the cold. When will the politicians wake up to the fact that it’s PRIVATE student loan debt which is destroying the financial lives of so many Americans? Is it simply a non-starter, because the special interest lobby is too powerful, or are they truly that oblivious to the reality of the situation? Perhaps Bernie Sanders’s Free College Plan is simply the start of something new, and he’s getting off on the right foot by attacking the easiest target, but I wish he had added a seventh point to his proposal that dealt with private student loans, especially considering how badly many of my readers need assistance with that specific problem. It could be argued that NPR is one of the most “Fair & Balanced” news sources currently available to ordinary Americans, so I want to include a review of their appraisal of Senator Sanders’s plan. Assuming that Bernie is able to get all six tenets of his proposal enacted, how does NPR think things will turn out for the country? In short, they’ve completely missed the point! But is that really the point? Does anyone even believe that the motivation behind Bernie Sanders’s plan is to make America the most educated? Can’t we all agree that this has little to do with actual education, and far more to do with excessive student loan debt? Feel free to check out their article by clicking through the link above, but remember that like many of the other Media outlets currently analyzing the Sanders Free College Plan, even NPR has failed to understand the genesis behind Bernie’s proposal. This plan is not about creating a highly educated workforce, which would be better served by enacting major education reforms, and getting away from an educational system that was developed while the workforce still sat in factories performing repetitive behaviors to produce manufactured goods, and which is now completely outdated to the needs of modern companies and businesses. If the objective were to make Americans the most competitive workforce on the planet, does anyone even really think that the existing college and university system is the best way to provide for that? In my opinion, only a fool could believe in such a fairy tale. Another bastion of the “liberal media” (if you’re to believe the pundits on Fox News) took aim at Bernie Sanders’s Free College Plan, and similarly to NPR, screwed the pooch by creating another straw man argument and attacking the plan for all the wrong reasons. Instead of focusing on the pros and cons of the six proposed tenets, CNN created a hit piece to discredit Bernie Sanders by attacking his proposal for being incapable of delivering on it’s core promise: providing free college for all. Rather than discussing the merits of the idea of reducing college tuition rates, allowing Federal student loan debt to be refinanced, and expanding work study programs for poverty-stricken students, CNN chose to attack the idea that the “Robin Hood tax” could fully pay for the proposal. Free college for all may sound appealing, but it’s not as simple as Bernie Sanders makes it out to be. So what? Even if the Robin Hod tax won’t be enough to cover the costs of the Sanders plan, is that really the thing that we should be focusing on? When it seemed like the Media was finally taking up the clarion call to support those holding excessive student loans, now that we’ve finally got a champion, outlets across the political spectrum have begun chipping away at the solution we’ve all been waiting for! What’s worse, these “Liberal” outlets aren’t treating the proposal fairly by discussing it’s pros and cons, but are instead creating side discussions to shoot it down by attacking incremental issues, like the fact that it won’t create the most educated workforce, or that it won’t be fully paid for by the new tax, etc. It’s time like these that Bill Clinton’s old campaign phrase: “It’s the Economy Stupid” comes ringing back to my ears, except that it needs to be modified to read instead: “It’s the DEBT Stupid”, and followed by an extensive series of exclamation marks. What the Media simply cannot seem to grasp (or won’t grasp, thanks to their ties to corporate financiers and special interest lobbyists, is that Bernie’s Free College Plan is NOT about Education, but about DEBT! And until the Media stands up to their corporate overlords, you’re likely to see further examples of this serious problem. Both the Right AND the Left will continue to attack the Sanders Free College Plan, addressing minor issues related to small portions of the proposal, instead of realizing that IT’S THE DEBT, STUPID! Now that you’re familiar with the plan, and it’s criticisms, what do you think about the proposal? Would you support Bernie Sanders in his mission to make college free, and to reduce student loan debt loads across the country? Or is this truly the work of a sinister Socialist/Communist plot to bankrupt American society and destroy our children’s brains by exposing them to the liberal elite at snobby colleges and universities across the country, eroding the very fabric of our once-great Capitalist society? See how easy it is to discredit the plan without even addressing it’s core tenets? Tread cautiously, dear reader, for thou art under attack by the powers who prefer the status quo remain in place. Read between the lines, and be sure to think for yourself. No matter what happens with Bernie’s Presidential Election run, one thing I do want to make eminently clear is that there are all sorts of excellent student loan relief programs already on offer! 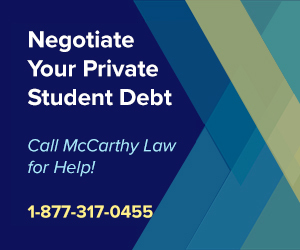 In fact, this website hosts over 100 different Guides on the many Federal and Private student loan debt programs currently available, so if you’re struggling to deal with your loans, make sure to take a look through some of the following links. No matter how much you owe, what type of debt you have, or how long you’ve been in delinquency or default, you’re almost certain to find some value from the Guides I’ve linked to above. For any other questions that you might have about student loans, please feel free to ask them in the Comments section at the bottom of this page. Just make sure to tell me if you have Federal or Private loans, because that’ll determine which relief programs you have access to. I spend hours per day, every single day, updating this website. It’s basically my 2nd full-time job. And I can’t keep dedicating that much time to this project unless I get some support from the community. As a Bernie Sanders fan, I’m sure you’re well-aware of how important it is to do your part to make things better for others, and the general community, and I want to ask you to do something super simple and easy for me. Don’t send me money, but please do post a link to my site wherever you think people with student loans will see it! Post it to Facebook, Twitter, Reddit, or an old-school Forum! The more people who visit my site, the more time I can spend writing up helpful, informative posts like this one, and helping people just like you. Zero support for any free college plan that doesn’t start with the elimination of existing loans. Free college for some but debt burdens for those that came before is a plan to get one generations votes at the expense of the one before it.